Last year's Call of Duty: Black Ops is officially the best-selling game of all time in the US, according to NPD. Flash back two years ago to early 2009: Activision said that it was hoping that Modern Warfare 2 would be the best-selling game of all time, and we laughed. Sure, it'd sell phenomenally well, but the best ever? What were the odds of that? 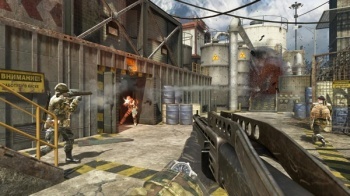 Modern Warfare 2 might not have topped the charts, but its successor Black Ops has done just that. In a statement released last night, NPD's Anita Frazier said that Black Ops had surpassed Wii Play to become the best-selling game ever in the United States. While there isn't a concrete number as to just how many copies Black Ops sold, Joystiq pointed out that Nintendo had claimed 13 million copies of Wii Play as of last October. Factor in the time since then - including the busy holiday season - and remember that whatever your own personal estimate is, Black Ops sold more than that. Black Ops moved 5.6 million copies on day one, but that was counting both the US and the UK, so there's no real way to know how it all broke down. The Escapist Editor-in-Chief Russ Pitts wasn't a fan of the single-player portion of the game, while I found the multiplayer side of things much stronger. Apparently, quite a few people thought the game was worth picking up for themselves, too. Congratulations, Treyarch. Enjoy your laurels before Call of Duty: The Next One breaks the record again.